Kaziranga lost over 500 rhinos in the last two decades of the twentieth century. The situation improved in the new millennium when an average annual loss to poaching came down to single digit. Even as poaching made a comeback after 2006, Kaziranga reported the biggest jump in rhino numbers. The latest rhinoceros census in Kaziranga reported a gain of just 12 rhinos since 2015. From 2,401 to 2,413, that is a jump by barely half a percent. Predictably, it did not make big headlines. But to many, this has been the best news from the famed rhino haven in a while. Kaziranga, finally, is getting real. To put things in context, Kaziranga lost over 500 rhinos in the last two decades of the twentieth century. The situation improved in the new millennium when an average annual loss to poaching came down to single digit, and the park reported a population of 1,855 rhinos in 2006. What followed was an intriguing pattern. After the 2006 Assembly elections, Kaziranga suffered a setback as poachers took out 20 rhinos in 2007. Again, at least two dozen rhinos were killed between the 2009 Lok Sabha polls and late 2010. 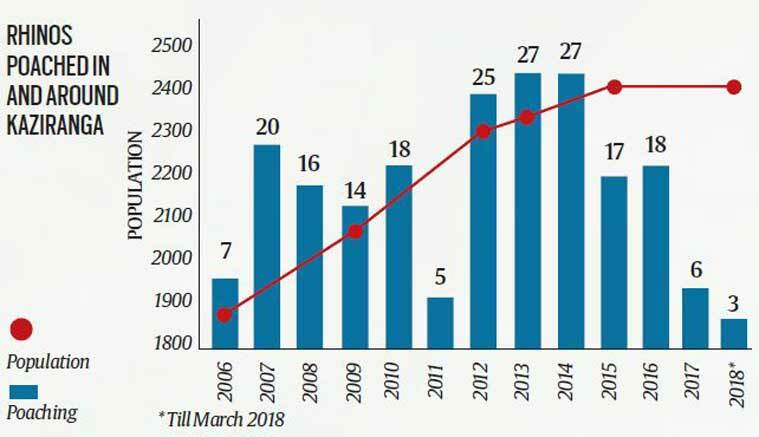 After a brief lull till the Assembly elections in 2011, poachers were back again, and the toll peaked around and after the 2014 Lok Sabha polls. But, even as poaching made a comeback after 2006, Kaziranga reported the biggest jump in rhino numbers. From 1,855 in 2006, the population swelled to 2,048 in 2009: a gain of 193 rhinos in just three years. Then, between 2009 and 2015, at least 170 rhinos were poached. On official records, rhino population increased by 353 — from 2,048 to 2,401 — in that period. Soon after, the park got a grip on poaching. It has reported 27 cases since 2016 — only nine since 2017. This presented an opportunity to claim a healthy population gain and draw closer to the vaunted goal of hitting the 3,000-mark in the Asian one-horned rhino population in Assam by 2020. Thankfully, Kaziranga refused to play to the gallery. By reporting a stable population, the park management has allowed the official number to gravitate towards reality. Even allowing generously for reporting bias, Kaziranga holds a rhino population in excess of 2,000. That is a big number and already stretching the park’s carrying capacity. That is why rhinos are found literally everywhere around Kaziranga. But outside the park boundary, their fate depends on local goodwill. Saving them there will take an even bolder course correction. Insiders attribute the recent drop in poaching to two factors. The enforcement, they claim, has reined in a battery of hostile informers used by the civil administration. In connivance with their controllers, this lot was apparently shielding poachers in return for big protection money. Simultaneously, the present government, say sources, broke the then decade-long tradition of offering political patronage to monetise Kaziranga’s rhinos in exchange for sundry electoral services. So far, the efforts are showing results. But Kaziranga and its rhinos still remain very much in the grip of both commercial and political interests. The animal is far easier to poach than, say, a tiger or an elephant, and far more valuable in that sense. A carton of horns fetches as much as a carload of tiger derivatives or tusks would. Naturally, poaching syndicates will not give up easily. The ever-improvising operators have switched from the Dimapur-Kohima-Imphal route to ferrying consignments through Arunachal Pradesh along the northern boundary of Assam and then down to Nagaland. Some are also active on a third route through Silchar. A few have recently shifted focus to North Bengal as well. The lure of rhino horns had in the past made it easy for local insurgent groups to strike cashless arms deals with operators in Myanmar. In the process, the United Liberation Front of Asom (ULFA) wiped out the rhino population in Burachapori forests, even as the National Democratic Front of Bodoland emptied the Manas National Park. More recently, a number of former militants, along with members of the Karbi People’s Liberation Tigers and Kuki People’s Army targeted Kaziranga’s rhinos. Sources claim that local and Bangladeshi Islamist groups such as the Muslim United Liberation Tigers of Assam, Harkat-Ul-Jihad-al-Islami and Jamaat-ul-Mujahideen Bangladesh have also jumped in. Ironically, ULFA in 1989 killed a rhino horn trader, warning against harming “the pride of Assam”, but its own cadres ran amok. 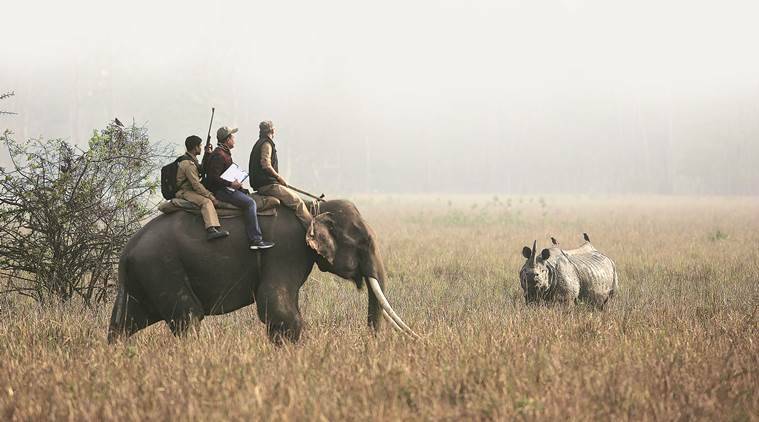 Even today, while rhino remains an emotive issue across Assam and was flogged strategically by the anti-Congress opposition before the 2016 Assembly polls, its constituency is far from robust where it matters the most: around Kaziranga. The forest administration never considered the local population — mostly tribals and Muslims — allies. Violent eviction drives against encroachers are common and, at least once, led to deaths caused by police firing. Tellingly, while only two forest staff have ever been killed by poachers since the late 1960s, hundreds of alleged poachers have been gunned down. In 2010, Assam extended legal protection against prosecution to staff who kill poachers. From a decadal count of just 17 between 2001 and 2010, the number of poachers killed jumped to over 50 in the next five years. To many, these figures seem to give credence to recurrent allegations of staged murders. The killing spree, however, did not have the desired effect as poaching scaled an all-time high since the 1990s. Little wonder then that the rhino does not enjoy much goodwill in its neighbourhood. The anti-migrant rhetoric against alleged Bangladeshis — and moves to selectively compensate only the Hindus among the evicted — have alienated the minority population in villages around the park. The management has every reason to guard against the hostile neighbours. But their hostility is a huge liability. Winning their support over time can be the best insurance against poaching. Given the mutual mistrust, that will be a test of character and intent. Ending persecution should be a good starting point.